Black & Navy Blue colors and sizes not listed have sold out. There is no more fabric. The shirt will not be made again. Please select an alternate color or print whenever possible. 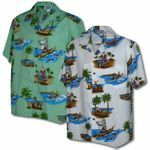 Men's Santa on the Beach shirt is a Hawaiian style shirt with Santa and his entourage. The intricate embroidery is sewn full size on the front of the shirt on the Polynosic silk-like fabric. The fabric looks and feels like silk and wears like silk but is much less expensive than silk.